Abraham was the father of Judaism, the founder. His first wife Sarah bore his younger son, Isaak, and his second wife, Hagar, his elder son Ishmael. After a quarrel, Abraham drove Hagar away into the desert, and it was prophesied that Hagar's son would become the forefather of a great nation, would be the Arabic people. My Israeli mother has sure instincts when it comes to guessing the background of people from the Middle East. "He is a Maroccan jew, he is an Iraqui, she is a Yemenite, but from Aden not from Sanaa. They are our cousins." By cousins she means Arabs. This way of thinking has been real to me since my earliest childhood. In my mother-tongue, Arab people are called "Bnei Dodim". It sounds poetic, biblical and familiar. It also sounds patriarchal. (Why not the sons of the aunts or the daughter of the oncles?) It is even possible to connect this idea with sensuality, since "Dodim" also means lovers. Why can't we then love the sons of those we love? We can't if we don't know them. The Israelis, with their jewish origins and beliefs, hardly know their Arabian neighbours although they live just around the corner from each other. The Arabian "cousins" are illicit workers with a poor image, are simply "the enemy", and to the public allarge they are "fundamentalists who would throw any Jew into the sea at the first possible opportunity". The more religious and Middle eastern the origins, the more absolute the verdict will be. Of course, there are variations on the theme. My own Israeli parents-in-law are a good example thereof. My mother-in-law is of Polish origin, a leftist and, while at the same time remaining very religious. My father-in-law on the other hand has very conservative political views, but is almost an atheist. He tells the same story over and over again, a story which for the European ears sounds like an evil fairy tale. As a young boy, he grew up with an Arab who brought him up as a nanny or a "big brother". Years later when they talked politics the Arab would say, thal on the day when all the Jews are thrown into the sea, he will personally cut the throats of my father-in-law and his family so they will not have to suffer so much. "For the Jews", my father-in-law would always say, "There will never be peace with Arabs. They hate us forever". I usually oppose that with the argument that the French and the Germans have been the arch-enemies over hundreds of years, and yet now have become allies. To thal he answers: "Arabs are not Europeans". For me, though, the holocaust is an evidence that the so-calIed advanced western civilizations can fall into barbarity overnight. Without a doubt a greal deal of humiliation, hate, envy and thirst for revenge still persists on the side of our defeated Arabic cousins. However the majority of us Israelis cultivate a tactic thal only makes the wounds deeper: contempt. Contempt played out over time and place. Contempt, disdain, arrogance and the belief that you are part of something better. This contempt is expressed by Israelis of European heritage, not only towards Arabs but also towards Jews with oriental lineage. This a direct result of the cultural shock experienced at the first encounter between european and oriental Jews in Israel. For my mother-in-law it was a sore point, that all her children married "black" partners, Jews with Egyptian, Iraqian and in my case, Yemeni origin, called "Misrachim" - "easterners". This term seems absurd; since Warsaw, for example, is situated further east than Casablanca. But "Misrachi" also means oriental. For me, it seems far from the mark. There is indeed a Jewish community in Shanghai and Bombay, but these groups are not meant with the saying "Misrachim". I call them "Arabic jews", with all the respect and esteem I hold for the arabic culture, and with the pride I feel belonging to this group on my mother's side. In Israel the expression "Arabic Jews" shocks people. The Middle Eastern Jews are desperately trying to stand out from the Arabs largely, I would say, because of their similarity to each other. A Euoprean would probably not recognize any difference between them. Yet, I think, especially they are a hope for fraternization, they could be the connecting link. Arabic jews are afraid of being confused with "the enemy". My molther never wanted to speach Arabic although it was her mother-tongue. She understood every word (and still does) but she answered in Hebrew. She was ashamed to take her flat Middle Eastern bread to school for lunch when the others would eat sandwiches. She would want to disappear from the scene when her father picked her up from the school wearing Sarouel, a traditional Arabic wide riding-breeches. A repression of the own identity and at the same time a wish to escape from the pattern of diaspora and to find a new Israeli identity. Despite by "white" Jews, full of complexes because of their "black" origin, they strive desperately to get their slice of the Polish-German upper-class pie. Recently, a few of them have begun to recognize the value of their own culture and preserve, cherish and develop it. Middle Eastern music has won a place for itself with the public, but unfortunately at a provincial standard. Where is the finest Arabian poetry, the finest Arabian music, the art of singing or improvisation at its very best? My Yemeni mother has grown away from her roots. For forty years, she has lived in Europe. She loves Austrian culture and manners, but in her soul she has remained a Yemeni. I stepped into the unknown when I began to work with Palestinian choirs. Although Nazareth is in Israeli territory, the inhabitants consider themselves Palestinian. With the greatest discretion and diplomacy I tried to get closer to the people to convince them to work for the shared goal of peace. It was hard going and many refused. The choirs function mostly not as individual artists, but as a communal institution and are often politically unindependent. It was an advantage that I come from Austria, a neutral country. A couple of times I had to reassure them that the project has nothing to do with the fifty-year anniversary of the nation of Israel. The level of distrust was extremely high. Was it by chance that all the refusals came from the Palestinian men's choirs and that in the end I find two female choir-directors as allies ? One was Noha, from Jaffo, who had founded the St. Anthony choir. The other was Katy from Nazareth with the wonderful Ensemble Ud al Nad. Women do not give birth with so much pain, only to send their children on to war. That purely pragmatic-biological reason would, in and of itself, be enough. So, with the Collegium Tel-Aviv under the direction of Avner Itai, I was able to bring Jews, Moslems and Christians together. I was overjoyed. I was so excited I couldn't sleep. It was the start of fulfilling my childhood dream of peace. A humble beginning perhaps but a place to start. Now it is only a matter of keeping it going. The encounter with the Palestineans moved me immensely. They were not strangers to me. I felt as if I knew them already. Their way of being and their body-language awakened trust in me. It reminded me of the many times in my childhood that I spent with my Yemeni grandparents. They came by foot from Yemen to the Holy Land in the 19th century, out of idealism, because of the dream of living in Zion. They spent most of their lives in Palestine, long before the founding of the Israeli nation, before Hebrew was introduced as the official language. Their informal language was palestinian. My grandmother could hardly speak hebrew. If the culture is defined by the language used, they were Palestinian. They differed from the other Palestinians only by their religion. Exactly like the Christian Palestineans differ from the Moslems. Their belief was strong and present, but never dictatorial. This image of religious tolerance has stayed with me. And I can imagine that the Moslem and Christian Palestinians were equally tolerant and still are. Religious dictatorship is not typical of the Middle Eastern culture. It is purely political. With this peace-project, I have encountered anew the warm-hearted, intimate, Palestinian way of being, and I have realized with happiness, how small the differences are. It could be expected that many Palestinians are descendants of Jews who were not driven out of the Holy Land by the Romans. This argument would bring "the enemy" even closer. But the idea that a Jew could in this way be converted to a Muslem would be a provocation for many Palestinians and Israelis. Only with respect and openness is this kind of a dialogue possible. In our case it is a musical dialogue through which we realize how much in common there is between Jewish, Christian and Moslem music and how much the Jewish-Middle Eastern sounds work as connecting link, especially in the Jewish-Yemenite songs that remind one strongly, at least in their scale, of Gregorian choirs. The scales have much in common with the cantoral and hassidic singing and Arabian-Moslem phrasing and cadence. This is a dialogue that is understandable not only in the Middle East, but everywhere. After all, the language of music is universal. A connection between the three monotheist religions can be found in the civilization of the Iberian peninsula during the Middle Ages ending in 1492 with the beginning of the inquisition. Jews, Christians and Moslems shared an intensive cultural exchange and lived with each other in harmony. There are intersections and parallels between the three monotheistic religions, not only in the field of music, but also in the historical incidents. The repertoire of the Israeli choir is a good example: European classical works, which, of course, include Christian music. J. S. Bach is part of the cultural heritage of the "Ashkenasies", European Jews who immigrated in Israel. Israelis, who, for example, run the music schools, identify themselves with the liturgic music of Purcell, Monteverdi and Bach, in spite of inquisition by the Christians and Luther's antisemitism. I spent most of my childhood in Vienna where Christmas became a part of my life. Although I do not celebrate Christmas, it is always a special day to me. There are also connections between the languages. Most of the Arabs, who live in Israel, speak Hebrew fluently. That way, they are up to date with what goes on in the Israeli media. They are free to profit from the way of living in the western culture. It makes them different from Syrian and Egyptian Palestinean and possibly enriches them. On the other side, unfortunately, most of Israeli Jews hardly speak any Arabic. In life-style and food there are also similarities. In Israel the Jews who have immigrated from Germany are called "Jäckes". That comes from the past when they wore jackets and neat socks, even during the strongest summer heat. Today "Jäckes" do not wear jackets anymore, but are still called that way, known for their sense of order and punctuality. My Israeli husband whose heritage is russian-polish had as a child dumplings, potato-mush and other heavy slavic food to eat, but today the Palestinian kitchen has completely found its way through, already because of climatic reasons. Falafel and lahina have become national foods of Israel. My mother-in-law uses ever and ever more olive-oil and harissa (a hot sauce) in her cooking, but her mother, an original of the Lodzerghetto in Poland, used to call coriander "Di verstunkene Petersilie", "the stinking parsley". My heritage and my identity are already defined by my name alone. Timna means Jemen in Hebrew and is rather an unusual name even in Israel. Brauer is significant too, as it was the name on the passport that my Jewish-Russian grandfather Simon Segal bought in 1917 in order to escape from the revolution to Austria. Before he married my grandmother he lived together with Adolf Hitler in a hostel for men. He was familiar with Hitler's speeches as early as the twenties. In spite of that, he believed in the German culture and chose not to flee to America, a decision which cost him his life in a Nazi concentration camp. As I am quite known as a singer in Austria, it is touching for me today when so many Austrian mothers call me to say that they have baptized their child Timna, and want to know what it means. It gives hope that today there is more openess towards the foreign and the unknown. Ausschwitz and the Queen of Saba are the two poles that have left their imprint on me and while the following statement might be considered by many as naive, by others self-satisfied, by the third leftist and by the fourth betrayal, it is the conclusion of my heritage: I want to love the sons of my uncles. Theodor Herzl, the Viennese founder of Zionism, came to Palestine in the 19th century, he looked in the harbor of Jaffo for a jewish coachman that could bring him to Jerusalem. The trip was most dangerous. There were bandits lurking everywhere to tie you up and leave you in the cactusfields. He found a coachman, who was my yemenite grandfather Yechiel Dahabani, a close friendship grew between the men from these two worlds. So the journey comes full circle, from Palestine, to Israel and back to Austria. 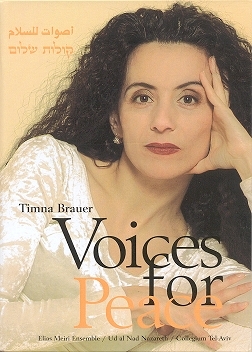 The recordings Voices of Peace took place in Vienna in December 1999, at a time when the peace process in the Middle East seemed under favourable conditions. In complete conciousness or even because of the presently difficult situation, we would like to publicize our musical statement.